Sophisticated and elegant our Rosalind White Freshwater Pearl Earrings will add that extra touch of class to any outfit you choose to wear them with. 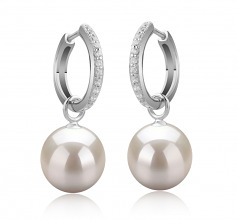 The silver loop and hook style in which gemstones have been set provide additional length to the high-quality AAAA grade Freshwater pearls in this set of earrings. 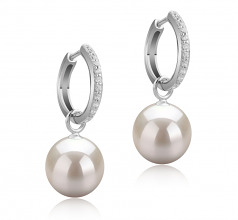 The overall design of this Rosalind white pearl earrings is very charming and the quality of the pearls can be seen in their perfectly round shape, and stunning luster, which will guarantee that you are making a very wise investment. 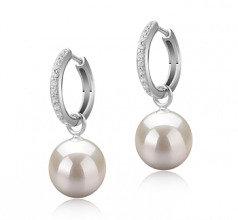 This pair of white Freshwater pearl earrings offers you the perfect combination of shine and sparkle with a little twist. 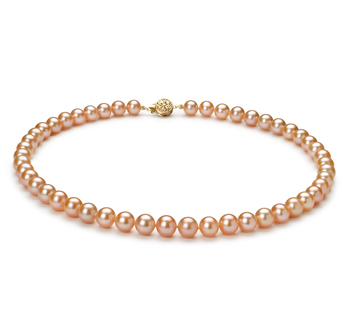 Each of the white Freshwater pearl earrings contains 10 gemstones within the silver that will stay safe and secure when you wear them throughout the day and well into the evening. Show only for "Rosalind Earring Set"